A violent storm of mythic proportions hits Prospect Park. The once peaceful service roadwhere a nature guide gives tours turns strange and even savage as she attempts to find a lost child. On her quest she meets the denizens of one of the few natural places left in a large city. The nature guide is a modern day Hercules – very strong, very loyal, a little thick, and trying to do penance for a very bad thing she had done when she was out of her mind. Obie award winning playwright (Map of Virtue) Erin Courtney examines what it means to be of service and the true nature of forgiveness. 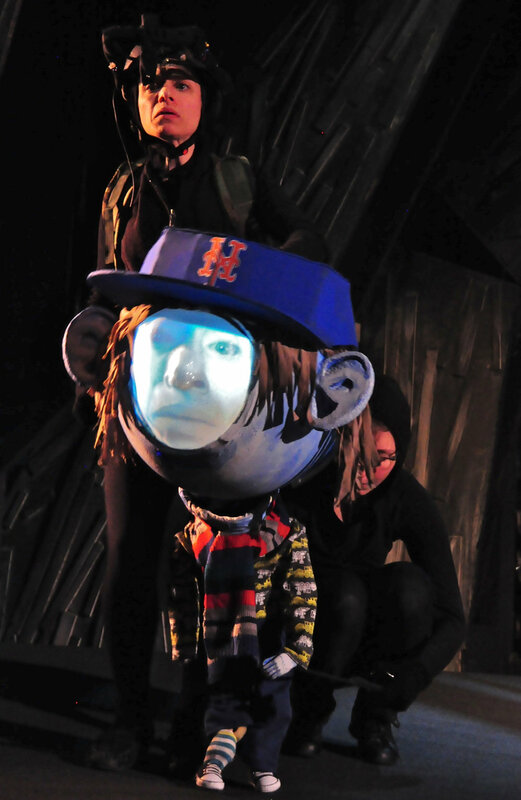 Work on this production began in the Spring of 2012 as Professor Cory Einbinder worked with the Entertainment Technology props crew to create Boy with a big head. Boy with a bighead was presented at the World Maker Faire in September of 2012. He is Artistic Director of Adhesive Theater Project, He holds an MFA from Brooklyn College. Cory is an Assistant Professor at NYCCT where he teaches in the Entertainment Technology Department.